It is a well-known fact that people use YouTube to upload videos for their personal and Business purposes. Now you wonder, who watched your videos and how you are getting more views and better engagement. Do you think that people who upload more videos on YouTube get more engagement? Do you think that people who didn’t upload videos on a regular basis don’t get more Views? It is a little bit tricky to finalize which is more important among Quality Vs. Quantity. What do you people think about it? To get a clear idea on it, have a glance on this Article. What is YouTube Content Quality? What is YouTube Content Quantity? Video quality has a higher priority on YouTube video content. YouTube content quality comes under three modules audio, video, and editing of video. A YouTube video with high-quality audio, video, and editing altogether called as Quality Content. Your video content should be interesting, that should be relevant to the topic. Those two qualities can lead to more engagement on the audience. YouTube Video Quality depends on the type of the video and the device you upload videos. Some People upload videos from mobile devices. Those videos are not good at Quality. While uploading videos on YouTube make sure to upload the highest quality videos if you are targeting to reach more audience. YouTube Algorithm demands quality videos continuous upload to rate your channel. But it takes time to prepare more quality videos. Nowadays all channels were maintaining consistency in uploading video. They are uploading at least one video per week. But, some people make a mistake by uploading many videos in a week. One powerful video a week can replace uploading daily one video. The quantity of the video also plays a significant role in your YouTube Channel Growth. Because it takes time to create quality videos. Other than wasting the whole week in creating one Viral Video you can create some videos like short videos, streaming Live videos. These type of video can also impact on your YouTube Channel success. YouTube is very competitive in the Video marketing world. 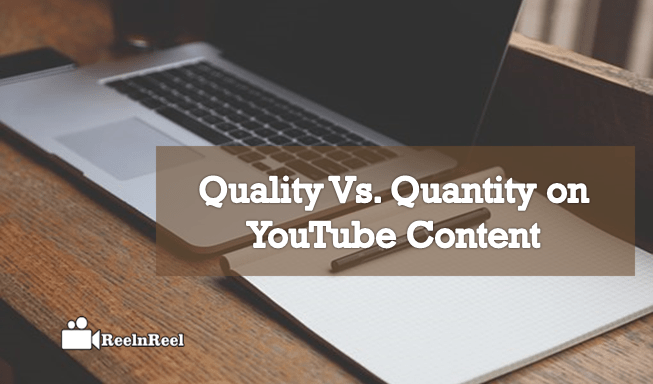 Initially YouTube Quantity and Quality both are two eyes to the YouTube videos. If you are setting up a new startup channel, go for both quality and quantity videos. One quality video shows more impact rather than creating more number of videos. If you post a piece of quality content on your YouTube, the search engine can easily trace your videos which leads more views to your YouTube video. By uploading more number of videos on YouTube, that only increase your channel video count. It does not show more impact on Views and Likes. Sometimes Quantity of the videos also makes sense on your YouTube content. Like short videos, Live streaming videos, live interacting videos. These videos will rise YouTube channel video quantity at the same time leads to engaging clients. Every YouTube channel success depends on the consistent strategic quality content. You should mainly focus on how to deliver more high-quality video which will trend for years not for a few weeks. Quality Content enhances your YouTube channel View, Live, shares and also Video watch time. If your channel posted a quality video, it would increase watch time of Video. You should maintain consistency in uploading the videos on the YouTube Channel. That means you are scheduling your Followers, and they will wait for your update at that time. If your not maintaining consistency in your channel you may get a limited number of followers. Your video should describe the complete story for which purpose you are creating the video. Video content Should be strategic. Quality is eligibility to makes people watch your video for a more extended period. Every youtube channel growth rate depends on the quality of the content. Every YouTube content creator should create quality content make sure to apply all factors in the Video. When it comes YouTube Video Quality and Quantity handful of factors across the board they make a massive impact on Youtube channel. First preference goes to the Quality of videos afterwords Quantity. YouTube Algorithm demands quality videos on YouTube channels. A Successful YouTube channel is the combination of both factors like Quality and Quantity.